There is a chance to shop locally right here on Beacon Hill next weekend at the St. George School Holiday Bazaar on Sunday, December 2 from 9 a.m. to 3 p.m. at the school’s Gathering Hall, 5117 13th Ave. S.
The bazaar will feature 30 vendors, including A Clean Sweep, Choice Organic Tea, Cookie Lee, Cupcakery, D’s Organic Concepts, Italia Imports, It Works! Body Wraps, Magpie Design Shop, Miche Bags, Pampered Chef, PartyLite, Pearl in Oysters, Rosso Gardens fresh wreaths, Sam’s Club, Scentsy, St. George Parish Fil-Am Association, St. George Parish Seniors, Tastefully Simple, Tupperware, and others. All ages are welcome. Activities for children include a craft table and cookie decorating. Eighth grade students are hosting a Santa booth. Breakfast and lunch food will be served all day, including biscuits and gravy, pastries, Ivar’s clam chowder, spring rolls, Spam musubi, and more. 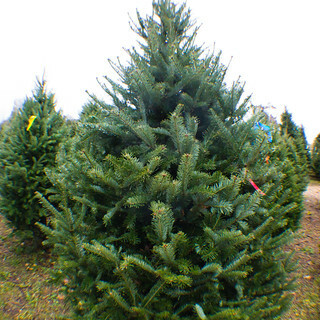 Performers will be on hand to entertain shoppers: Traci Hoveskeland at noon, and the St. George School Choir at 1 p.m. Admission to the bazaar is free. 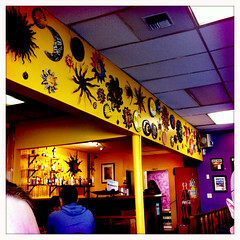 Suns and moons overhead at El Quetzal. Photo by Wendi. 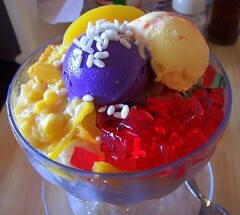 If you hurry, you can get a Groupon voucher tonight for $15, good for $30 of food at North Beacon Hill’s El Quetzal. The offer is good until midnight tonight (Monday). Find it here. Come join the North Beacon Hill Council at 6:30 pm, Thursday, December 2 in the Beacon Hill Library Community Room. No speakers, just food and a chance to meet your neighbors! We’ll do a bit of bragging about what has happened in the past year, thank the Board members for their hard work, and enjoy spending time together. Pizza, salad and water provided by the NBHC Board. Plan to join us! The library is located at 2821 Beacon Avenue South. St. George School is holding their annual Holiday Bazaar on Sunday, December 5, from 9:00 am to 3:00 pm in the school hall, 5117 13th Avenue South. The bazaar will feature over 25 talented jewelers, artists, crafters, and Fair Trade and commercial vendors from the local community. There will be a continental breakfast available for $3.00, and entertainment will be provided by students, family, and friends of St. George. There will also be a themed gift basket raffle. 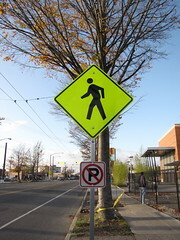 The Pedestrian Advisory Board needs you! Photo by Wendi. Interested? Email a resume and cover letter explaining your interest by December 17 to Brian Dougherty at brian.dougherty@seattle.gov. For more information, call Dougherty at 206-684-5124, or send e-mail to the address above. Registration is now open for Adult Beginner to Intermediate Spanish classes at El Centro de la Raza. The classes will run from January 11 through March 17 on Tuesdays and Thursdays from 6:00 – 7:30 pm. Information and a registration form is here. A new restaurant is having their grand opening this weekend in the Valley near the eastern edge of Beacon Hill: St. Dames, a “neighborhood joint for vegetarian fare and spirited care” in the old Maki and Yaki location at 4525 Martin Luther King Jr. Way South, just a block north of Columbia City Station. They promise “Food, drinks and fun for the whole family! The Goodwill Job Training and Education Center just north of the Hill at 1400 South Lane Street is holding registration this month for free classes that will be offered in January and February. Classes will include a nine-week Retail and Customer Service Traing Program, Community College 101, English for Speakers of Other Languages, basic computer skills, writing, math, and cashiering. Registration will be held from December 13-17 from 9:00 am to 3:00 pm. For class availability and enrollment information, call 206-860-5791. Still need to do that Christmas shopping and the buses aren’t running? What if you had to do all of your holiday gift shopping without leaving Beacon Hill? Is it possible? The Hill is not known for having a ton of retail, but that doesn’t mean we have to head for the ID, Georgetown, Columbia City, Downtown, or (God forbid) Southcenter to find gifts. Our neighborhood has plenty of great gift ideas to choose from, easily accessible by foot for many of us, making shopping on the Hill a healthy and green option as well as one that supports our neighbors who do business here. I spent “Cyber Monday” not online, but on foot, browsing North Beacon Hill for shopping opportunities. I was not disappointed. Here’s what I found. 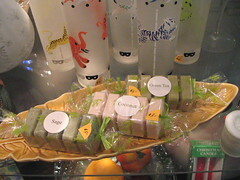 Soaps and other gifts at 3 Brothers gift shop. Photo by Wendi. 3 Brothers Cleaners, a dry cleaner at 3210 Beacon Avenue South, is not just a dry cleaner. They also have a small but well-stocked gift shop in the front of the building. The shop has the usual gift shop merchandise: knick knacks, glassware, clocks, candles, soaps, decorations, and the like. The prices seemed very reasonable. I bought a very pretty faux-silk embroidered drawstring pouch for $3. Victrola Coffee, in the old Galaxie shop at 3215 Beacon Avenue South, has Victrola logo ceramic mugs for $7.95, and travel mugs for $14.95. Combine either of these with some fresh coffee beans, and you have an excellent gift for any coffee lover. Buggy at 3315 Beacon Avenue South is closed on Mondays and Tuesdays so we weren’t able to go in, but from previous visits we know that the shop is more than just a “baby stuff” shop. Yes, there are baby and kid things galore, including clothing and toys, but there are also knitting supplies, handmade bags, journals, and other gifts that even non-parents would enjoy. We particularly like some of the items from da-a tis. 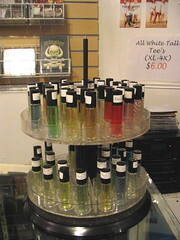 Fragrance oils for sale at Spoons. Photo by Wendi. Spoons Urban Apparel at 2516 Beacon Avenue South advertises “urban apparel and more,” including an assortment of fragrance oils for men and women at $5 per vial, and a collection of $10 t-shirts. They also have a very cool “Beacon Hill” painted sign inside the store, which is located in what was a long vacant storefront at the junction of Beacon and 15th. Yoga on Beacon at 3013 Beacon Avenue South was also closed during our shopping trip, but we see that they have a nice selection of workout clothing. A class card or unlimited membership would also be a great gift for a yoga student. Hello Bicycle at 3067 Beacon Ave South has an assortment of bicycling accessories, and bicycles as well. Their hours are limited; check the website or call before stopping by. 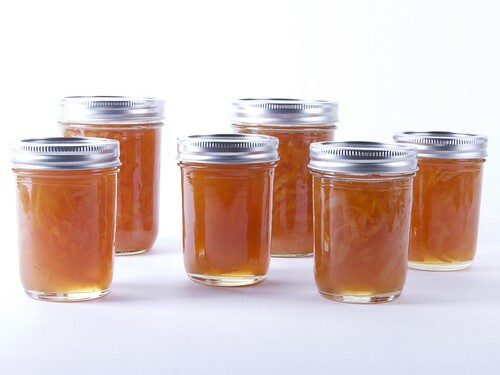 Edible gifts are a great option for the foodie in your life. Despi Delite Bakery at 2701 15th Avenue South has a great assortment of Filipino pastries and many other baked goods. They sell gift certificates for any amount, they say — just ask. Gift certificates good for a bunch of baked treats like these may be found at the Despi Delite Bakery. Photo by Wendi. 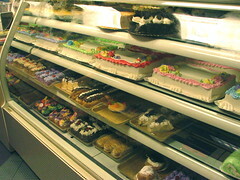 Local grocery stores such as the Hilltop Red Apple at 2701 Beacon Avenue South have premium candy, fruit and wine, and flowers to decorate the dinner table. The folks at Culinary Communion at 2524 Beacon Avenue South sell gift certificates for their cooking and wine classes. 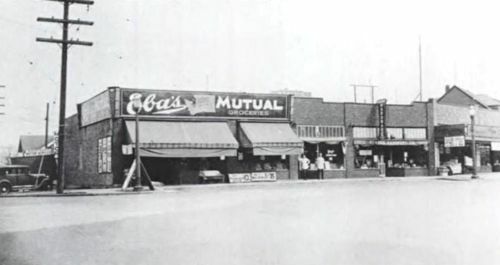 The shops mentioned here are less than half a mile apart in the North Beacon Hill business district. Who needs a car? But this is only North Beacon. Do you have favorite shopping destinations in Mid-Beacon or South Beacon? Please post a comment. We’d like to feature them, too.